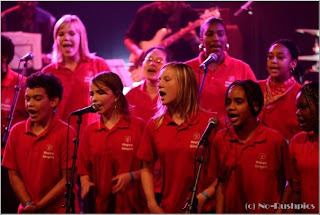 On the 22nd and 23rd of August 2009 the Happy singers make their first ever visit to sing in the UK and outside the Netherlands’ base for that matter. I feel very excited about this. I have been priviledged to be choir director for this bunch of teenagers for close to 9 years now and in that time, we’ve sang all over the Netherlands, in churches, concerts, and festivals ,won the odd award there and even been on National TV a few times. I give God the glory. Have always dreamt of taken them with me outside the country till the door opened to make this a reality . This is a group under the Salvation Army that started with the desire to make something good out of a bunch of growing kids from various sometime dysfuntional backgrounds and grew over the years. I was invited to sing at this concert and there were questions about how many were coming, of course I said off hand, just me in my usual solo thinking, God had another plan. On a particular day while on a plane flying back from an engagement in the US, an idea suddenly came in my head to aske the organiser if I could bring a choir, the rest as they say is history. Never give up on a dream.